Takeaway: Work causes stress and fatigue which reduces employees’ work performance as the day progresses. Encouraging breaks throughout the day improves employee well-being, helps to reduce work-related injuries, and increases productivity. More hours do not necessarily mean better work. Your employee brings physical, mental, and emotional resources to the workplace but these resources become depleted as the day progresses. As stress and fatigue set in, the employee’s well-being, as well as job performance, is affected. There is also an increased risk for accidents and injuries. Rest breaks throughout the day, which provide a diversion from the demands of work, allow for recovery of personal resources. We easily recognize the tiring effect that physical exertion has on the body. No one would expect an athlete to run one race after another without a period of recovery in between. Sustained mental effort has a fatiguing effect on the brain resulting in a slower pace of work, much as a runner experiences physical fatigue. This reduces concentration and creativity as well as slows work. This causes lower productivity, reduced ability to make decisions and a greater chance of errors. Studies have also demonstrated a link between occupational injuries and fatigue, even at low to moderate levels. Prolonged work also contributes to musculoskeletal discomfort, eye strain, and repetitive motion injuries, in both physically active and sedentary workers. With increasing mechanization and computerization, more people sit while they work than in the past. Epidemiological studies have linked prolonged sitting with an increased risk for various chronic diseases, such as cardiovascular disease, colon cancer, insulin resistance, and type 2 diabetes, to the extent that it can be considered a serious public health concern. (Learn more in The Negative Health Implications Of Sitting All Day And What To Do About It). A lack of recovery of personal resources during the working day also depletes the employee’s emotional resources. Emotional control is reduced and this can have a negative effect on how employees relate to customers and co-workers, as well as how they react to incidents. Extreme levels of stress and fatigue within an organization as a whole can cause low morale, reduced quality of work, high levels of absenteeism, poor industrial relations, and high staff turnover. We need to put in a controlled effort, also referred to as self-regulation, while working. According to theorists Muraven and Baumeister (2000) individuals have a limited psychological resource for self-regulation. As we self-regulate, this resource becomes depleted and further efforts at self-regulation become increasingly difficult. Research has shown that breaks allow for recovery of personal resources, measured in reduced levels of stress and increased well-being. Recovery improves work performance, provided that further self-regulation during breaks is avoided. Trougakos found that when employees engaged in breaks consisting of activities that they preferred and enjoyed (respites), physical and mental resources were recovered and emotional well-being improved. Recovery was much less if employees engaged in activities which required effort and were not preferred. For extroverts, social interaction with colleagues during a lunch break is usually replenishing. Introverted people, however, may find social interaction tiring and they would rather read a book, meditate, or go for a walk during a break. Labor, or health and safety, legislation often only provides for a lunch break during an eight-hour shift, although some areas have begun to acknowledge the need for more breaks. There is evidence that more frequent mini-rest breaks have benefits in terms of productivity, reduction in visual and musculoskeletal discomfort, as well as a decrease in accidents and injuries. 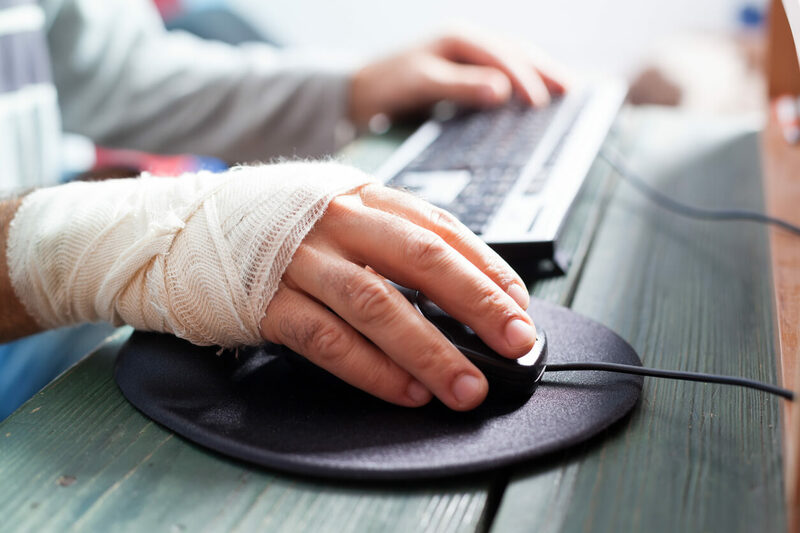 Ergonomic research conducted at Cornell University found that computer users who were alerted to take short rests and breaks were 13% more accurate than those who were not alerted, without any reduction in the number of keystrokes. Another study reported reduced eye strain and upper body discomfort, without a decrease in work output, where four 5-minute breaks were added to the regular two 15-minute breaks throughout the day. Occupational health legislation requires employers to manage potential health hazards. The demands of work cause stress and fatigue, whether physical, mental, or emotional. This poses risks to the health and well-being of employees and can also result in occupational accidents and injuries. Assess what breaks are needed for each type of work as determined by the nature, intensity, duration of physical and mental effort required by the particular job, and applicable regulations. For example, more rest periods are needed for jobs which require a fast pace or a high degree of concentration and vigilance. Design tasks to avoid extremes of mental and physical exertion and make sure that the length of breaks allow for adequate recovery. The timing of breaks will depend on the nature of the job. Where employees work on their own, or in small groups, the arrangements for breaks can be informal. They can take a break when physical discomfort or fatigue set in, and in terms of work flow. Knowledge workers, in particular, should be allowed to choose when they take a break, rather than having fixed times. Rules on the number, timing, and length of breaks are necessary where machinery determines the pace of work or where workers are interdependent. Employers should create a culture in which breaks are encouraged. Many employees fail to use mini-breaks and even work through their lunch breaks for various reasons. A survey of office workers and management found that more than 25% of the workers did not take any breaks, except for a lunch break, and most of them said that guilt was the reason. This was while 90% of the employers said that they encouraged breaks and 86% of the workers believed that they would be more productive after taking a break. Employees should be informed of the advantages of taking breaks, both for their own well-being and improved work performance. They should be advised to pay attention to physical or mental discomfort and fatigue and to take a break to recover when necessary. Even a break of a few minutes to change their body posture or stretch, adjust field of vision, or switch off concentration, can make a difference. Also encourage employees to disconnect from work during longer breaks and engage in activities which they personally enjoy and which promote positive feelings. This allows them to resume tasks with greater alertness and energy, which in turn improves job performance. Job related stress and fatigue can lead to vast hidden costs to the company that can be reduced by regular work breaks. Sufficient and effective breaks not only improve employee well-being and job satisfaction, but also reduce errors, accidents, and injuries.